While we were traveling with the military for 30 years we always found ways to get home and enjoy family times with our extended family. I was one of 7 brothers and one sister and we still enjoy being together. Recently, we found some old pictures and posted them for the family to see. The one on the left brought many belly laughs when it happened and 30 years later when it was pulled out and shared again. We always found ways to be adventurous and have a good time. We were active and stayed fit and it saved us many times! 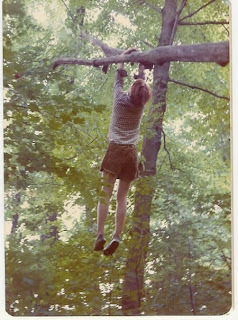 For this story let's just say this is my youngest brother hanging from a teeter totter! Not your normal playground teeter totter but a long dead tree that fell into the crotch of another tree and ended up very balanced. He was on the ground end while another brother crawled up the trunk to start the teeter tottering. I was standing next to the tree and not really thinking about the consequences held my foot on the tree while the upside brother crawled out farther and farther. When I took my foot off he was so far out he shot to the ground and sent the victim into the trees like a catapult would! This picture reflects how he caught the tree on the way down. Pretty scary since he is still 30 feet in the air! But he arrived safely on the ground and no emergency room runs so we can still laugh today! Find the time to get home and spend time with your extended families! Let us know about your adventures while living military! I have another one about spranging in Iceland that I will relate in a future blog. Does a Better Burger have to be Bigger?